Unfortunately, there is no single reliable source of cryptocurrency quotes exist. However, for our experiment with the Bitcoin hypothetical options, we have taken the historical end-of-date quotes provided by Yahoo Finance for the 7.5-year period from June 16, 2010 to February 26, 2018. From now, it is accessible in OptionSmile Studio, with daily updates. As expected, the average return is quite high - 15.7% per 20-day interval. However, it is also accompanied by huge volatility - around 50%. All these numbers annualized give us not so impressive 1.1 Sharpe ratio. 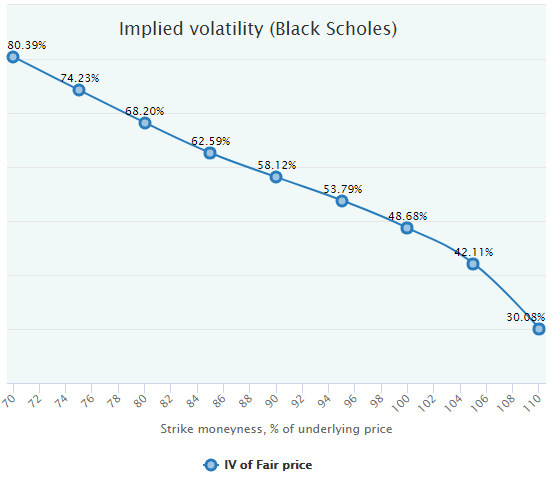 Very high kurtosis and huge positive tail are obvious, and all that has a significant impact on the valuation of our hypothetical option contracts. Let's look more closely at it. Obviously, the Fair Values are very high. It is almost impossible to find a regular financial asset having the price for at-the-money calls (100 moneyness) equal to 21.07% (!) of underlying. Overall, the time value of more than 20% for 20-day options looks fantastic even in comparison to the most volatile optionable assets. Besides the absolute level of more than 200%, it is interesting to note the shape of this "smirk". 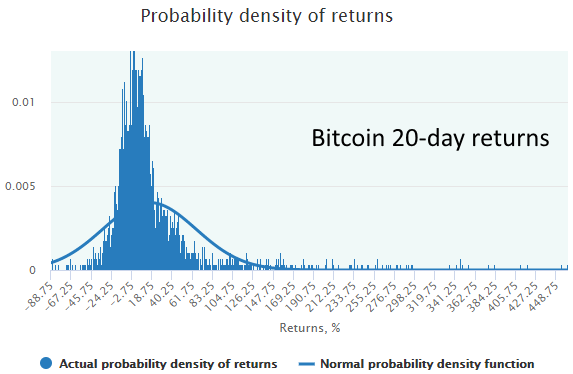 Despite the significant positive mean return and the "fat" positive tail of the Bitcoin returns distribution (see above), the right-hand side implied volatility is elevated relative to the left-hand side. Really, that shape of the "volatility smile" is not typical for such a "right-fat-tailed" distribution. One should have expected more commodity-like "smirk" with higher positive wing and lower negative one. It definitely deserves more thorough research. 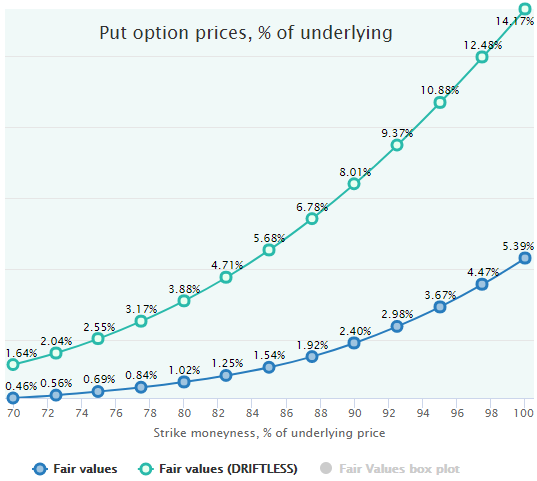 Interestingly enough, the Fair values of the deep-in-the-money put options (moneyness > 110) are less than their "intrinsic" values (it is impossible to find IVs for such prices). It usually takes place when the underlying returns distribution has a strong positive drift exceeding the risk-free rate by far, which is true in our case, see the charts above. 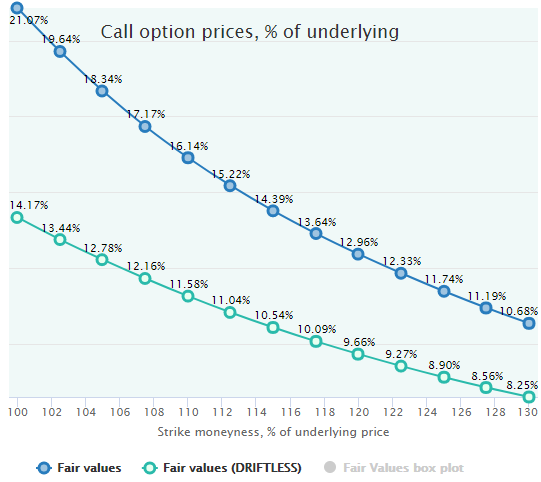 Also, note that the put options IV is substantially less than the calls one. 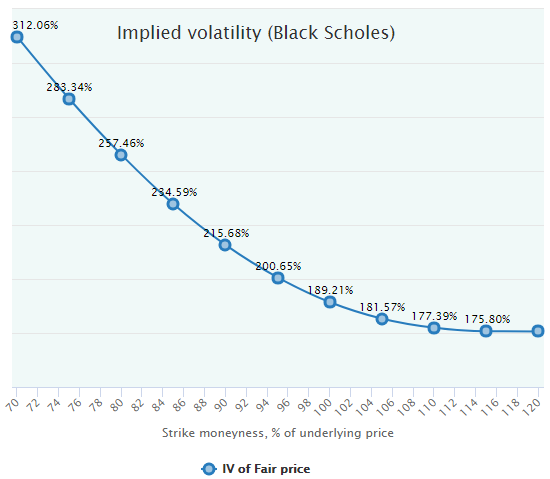 It is also logical and also takes place due to the strong positive drift in the Bitcoin returns distribution, while Black-Sholes model assumes the drift being equal to the risk-free rate (risk-neutral valuation). 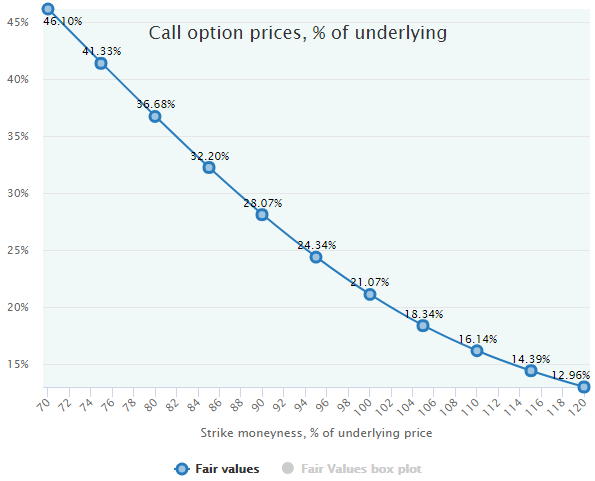 For more about the empirical put-call parity, see this blog post. Overall, that positive drift of Bitcoin prices has a huge impact on our theoretical option Fair Values. Let's look at the fair prices in comparison with the same values with the drift elimination (for more about this logic, see Driftless Option Fair Value). 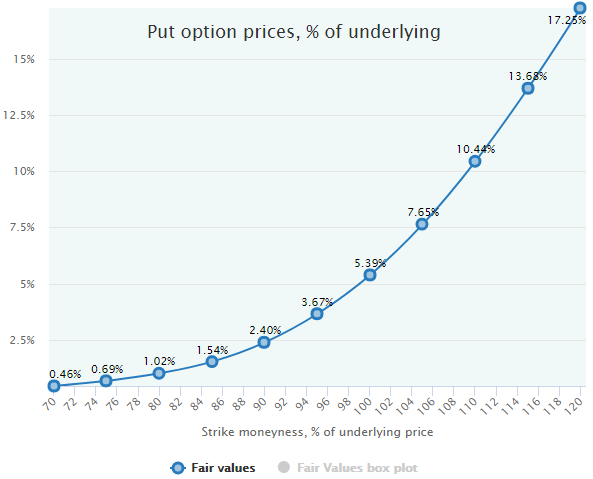 Obviously, the observed Bitcoin uptrend in responsible for a big part of its option values: it lifts the prices of calls and decreases the puts valuation. In any case, as it was mentioned above, it is difficult to extrapolate these Fair Values to the future. It is necessary to admit, that in contrast to the conventional and optionable assets (indices, stocks, ETFs) which have a long history of repetitive price patterns, all cryptocurrencies have had very short history and have been going through very diverse and still unique market regimes. The identification and analysis of all these regimes is, obviously, the topic for another research. All OptionSmile Studio users can conduct their own similar research with Bitcoin and other cryptocurrencies (like Ethereum and others).